Use the National Instruments CompactRIO (cRIO) system and Developer Suite software to monitor and calibrate up to 96 devices thorugh varying levels of carbon dioxide, temperature, and humidity. 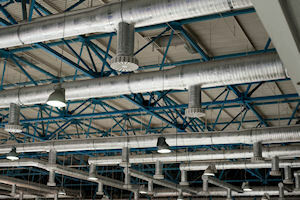 Public buildings require ventilation to sustain indoor air quality (IAQ). In many cases, that quantity of outdoor air introduced is held relatively constant through the day. However, a school classroom, for example, requires different ventilation when the room is occupied than during a lunch period when the room is empty. Controlled ventilation based on feedback from sensors within the space can greatly improve IAQ by increasing air flow when needed and save energy when the system demands less flow. An industry leading manufacturer of IAQ controlled ventilation products had existing test equipment based on custom hardware and custom software to control the test cycle. Changes to the test sequence required additional custom software to be written. The system was limited to testing 32 devices at one time within a temperature and humidity chamber that was manually controlled. Tecnova was asked to design a more robust automated tester for up to 96 devices using off-the-shelf components. Testing of both analog (4-20mA) and digital (RS-485 via Modbus or LonWorks) versions of the device was necessary. A New temperature chamber and controller were procured so the temperature profile could be automatically controlled via software. The resulting test system is based on the National Instruments cRIO platform using C-Series modules and LabVIEW FPGA routines on the backplane for all I/O and communication. LabVIEW Real-Time embedded code within the cRIO reads measurements from all the devices during the test cycle, controls the temperature chamber, and monitors and reports any faults. A host computer provides a simple user interface to configure test cycles, report test status, and provide long term data logging and report generation capabilities. Data is exchanged between the cRIO and PC via shared variables. Tests are scripted through standard text file input to the application. Off-the-shelf hardware and the flexibility offered through test scripting makes the end-of-line tester more efficient and more adaptable when the new products are released. The result is a 2X to 3X increase in the number of units tested per shift.